Features a print and actual cells of film from the Harry Potter series! Relive the magic of the 8-part Harry Potter film saga! This limited edition piece includes posters from each of the eight films, as well as 2 film cells for each movie. 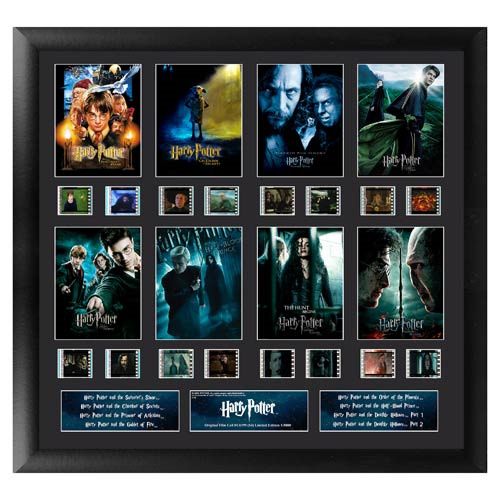 Travel back to Hogwarts with Harry, Ron, Hermione, and the whole gang when you display this 20-inch wide x 19x inch tall piece of film history on your wall. This film cell includes a black mdf frame, a numbered limited edition name plate, and a Trend Setters embossed/foiled certificate of authenticity.